When Herod the king of Judea in ancient Palestine first heard the prophecy about the Baby to be born in Bethlehem he slaughtered all the children under two years old in the land. (Matthew 2:16-18) The motive of this horrible act of terror was an attempt to prevent the Baby Messiah named Jesus from forever changing the world. 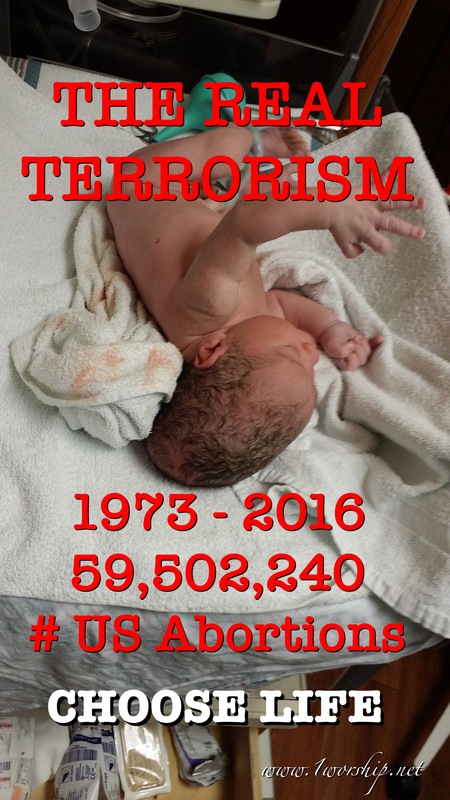 When the ancient adversary Satan first heard the prophecy about a new generation of young Christian world changers rising up in America he orchestrated the slaughter of 59 million babies aborted from mother’s wombs. The motive of this horrible act of terror was an attempt to prevent the third great awakening from coming to spiritually revive America and the world. This is the real terrorism. Stop terrorism. Choose life. Our future rewards are in the womb.